There’s nothing Theon loves to do more than jump. On his bed, our bed, the couch, the stairs. Almost like a bouncey Forest Gump; if he’s going somewhere he’s jumping. 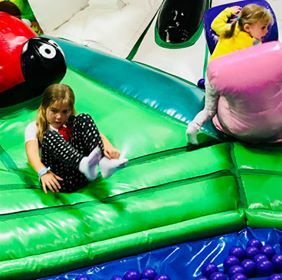 So when Inflata Nation offered to send us to their inflatable theme park for a fun filled bounce session, we literally jumped at the chance! 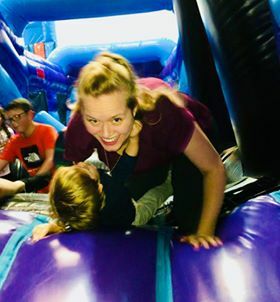 The Inflata Nation park is like those fun-filled bouncey castle birthday parties you went to as a kid. But on steroids and all under one roof! InflataNation is the brain child of couple Matthew and Michelle. Who’s ultimate ethos is fun accessible to everybody at anytime, rain or shine. With Penelope only being 12 weeks, we decided to invite a couple of our friends (Mia, 3 and Lily, 6 as well as their adult Sarah). You know what they say? Friends who bounce together, stay together. Despite her freshly baked size, LP didn’t have to stay at home. With a viewing gallery and lovely little jump facing coffee shop, Dad was able to sit comfortably, babe and latte in hand. To be honest I’m not entirely sure how me and my pelvic floor ended up on the bouncey side of the deal!? 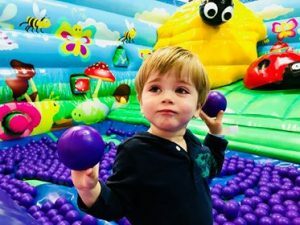 Now bouncing is fun but, don’t assume that your days activities stop there. 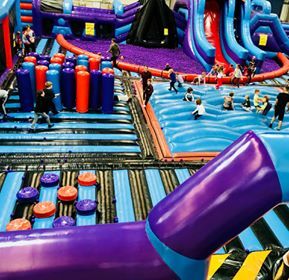 This boucing warehouse has a whole array of inflatable assault courses and tasks to tackle. 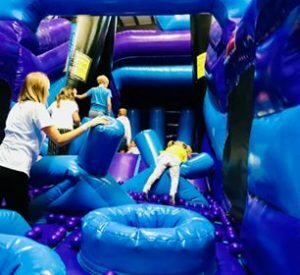 From the Inflata-Wall to The Duel: A gladiator duel, like no other! This takes balance and skill to stay upright on a moving platform at the same time as trying to knock your opponent off with a pugel stick. Perfect as an alternative to marriage counselling or to resolve bickering siblings! A great day was had by all. Our Mancunian weekend wasn’t ruled or called off by the relentless rain. I braved the vertical “big” slide and the kids burnt off all their energy. Which meant that later they slept like they’d never slept before- Thank you InflataNation! The arena was also big enough to keep everyone entertained and have something to accommodate each one of us, but not so vast us mums had to worry about losing the kids. So, how does the park fare for adults and kids? Well, I was actually really surprised at how much fun I had. And just how much there was for all of us to do both collectively and individually. I went for a bit of a work out and did a couple laps by myself while Yannis stayed and watched Theon play in the Inflata-Tots section. Specifically for under 4’s. Theon found the larger jump area a little over whelming to do (even with me in tow). But he happily bounced away the time in the mini ball pit. The girls however, ran wild and had lots of fun across the entire stretch of the park. Everyone left on a bounce high; well entertained and happily worn out! I absolutely love inflatanation! Even at 23 it’s such good fun for all ages. Theon looks like he had a great time. Perfect place for these rainy autumn days! This was so much fun, again soon pls!! !